These modern and contemporary rooms feature a queen bed all Pillow Top mattresses with doonas, dining table for two and lounge area. Recently refurbished. Modern & contemporary; these suites are the ultimate. A spacious yet cosy setting allows you to relax on the lounge whilst watching TV or unwind with a bubble bath in the corner spa. 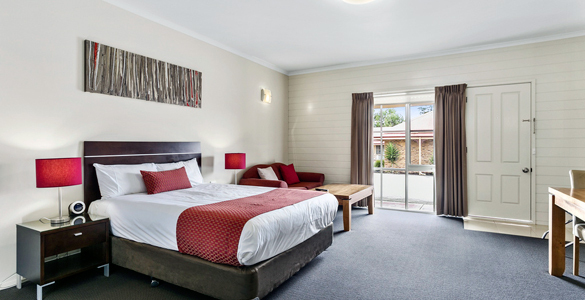 It offers a king bed with doona, large bathroom, bathrobes for your comfort and dining area. The deluxe family room perfectly accommodates a family of four with a queen and two single beds. The room features a dining table with two chairs. These modern and contemporary rooms feature a queen bed, large walk-in shower, separate lounge area and two TV's. The Standard Family Room features a Double Bed and two Single Beds. The room is ideal for the budget conscious family looking for a comfortable room in which to sleep. The room has LED TV, Mini Bar, Tea and Coffee Making Facilities and is air conditioned for family comfort.